In March 1881, a silver spike was driven into the railroad at Deming to mark completion of the second transcontinental railroad, which united the Santa Fe and Southern Pacific railroads. 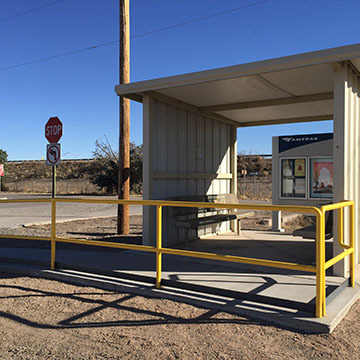 At Deming, passengers use a small shelter with benches; the street at the grade crossing is used to board passengers. When the first transcontinental railroad was completed at Promontory Summit, Utah in 1869, the last tie was secured with a golden spike to commemorate the momentous occasion. Deming is famous as the locale of the silver spike, for in March 1881, the town became the site of the completion of the second transcontinental railroad, uniting the Atchison, Topeka and Santa Fe (ATSF) from the east with the Southern Pacific from the west. Upon the joining of the two lines, Deming received a “union station” building serving both railroads. It was a large two story structure that served as both the depot and a hotel. In addition to the station, the town also gained a Harvey House restaurant. Before the advent of dining cars, passenger trains would stop at stations to allow guests to partake of meals. English immigrant Fred Harvey teamed up with the ATSF to create a chain of fine dining establishments along the ATSF lines. Often these restaurants, known for wholesome food and quality ingredients and service, became centers of social activity for local townsfolk. Deming was no exception. Due to its important location along the two rail lines, Deming’s depot welcomed Presidents Hayes, Harrison, McKinley, Roosevelt and Truman. In 1930, the station was remodeled into a one story building with wood clapboard and tall, full length windows. It had a hipped roof and deep eaves to protect passengers from the hot desert sun; the Harvey House also received a makeover. In 2004, both were relocated to Pit Park where they can be admired by visitors. The area today occupied by the town was home to the Mimbres Indians about 1000 years ago. Living in small agricultural villages along the river which bears their name, they produced pottery which is today world famous. Mysteriously, they all but disappeared by the thirteenth century. Featuring abstract images of animals, pieces discovered in the early twentieth century provided design motifs for the ATSF. Mary Colter, a designer for the Harvey House system, used these designs in a set of china used on all ATSF Super Chief dining cars from 1936-1970. Reproduction Mimbreno china is still sought today by railroad enthusiasts as well as admirers of Native American crafts. Visitors to Deming can visit the Deming Luna Mimbres Museum to admire original Mimbres pottery discovered at archaeological sites throughout the valley. The museum also tells the story of the town. Prior to the arrival of the railroads, Deming was located close to the Butterfield Overland Stagecoach route which ran to the north of the present town. The railroad stop was named after Mary Deming Crocker, wife of Charles Crocker, one of the main backers of the Central Pacific Railroad, a predecessor to Southern Pacific. Mrs. Crocker was well known for her charity work in the U.S. and abroad. The town was known too as the “City of Windmills” for the machines which were used to pump water from aquifers. This water was and is still used to raise chili peppers, onions, cotton, pecans, feed crops and cattle. Each year, Deming holds the Great American Duck Race on the last weekend of August. Duck owners can enter their fowl in various wet and dry races. For those without a duck, there is also a chili cook-off, tortilla toss, outhouse race, and other festivities. Amtrak does not provide ticketing or baggage services at this facility. Deming is served by the tri-weekly Sunset Limited/Texas Eagle (Westbound: Tuesday, Thursday, Sunday; Eastbound: Monday, Thursday, Saturday).